Most moms wake up via kid alarm clocks wanting food or needing some sort of assistance. After getting the kids fed and ready for the day, whether its taking them to daycare or school, it leaves little time for you to do anything beyond getting yourself ready and out the door at the same time. You experience your full workday and come back to your full work night, caring for the kids, making sure they, AGAIN, eat. Then helping them with homework, or keeping them from injuring themselves. After everyone has bathed, eaten and gone to bed, you’re so exhausted you barely have the energy to collect all the dirty laundry and sort it before tossing it in the wash. That’s where you find you threw a load in days ago and its smells of mildew from sitting in the wash for too long. Dang it! Now you have to wash it again and add a cup of white vinegar to get rid of the weird mildew smell. How are there never enough hours in the day to get everything done or how are there so many mouths to feed, but no hands to help!? Don’t wait until your home is a complete wreck to try and do something. That is when it will feel overwhelming and take forever. Plan to do 1-2 little things a day. That way it never feels like you never get anything done. As Frugal Living Expert Jordan with FunCheaporFree.com says, plan some things out weekly or monthly depending on how dirty they get during that time. You may need to adjust your schedule. Angieslist.com suggests doing ten minutes of house cleaning a day as well and they give you a day off! So there are tons of tips on how to keep your house clean. Tuesday: Floors a quick vacuum in high traffic areas and a quick Swiffer Wet Jet mop where needed. Wednesday: Bathroom, tackle as much as you can in 10 minutes. Start with anything that needs to soak for a few minutes to help make your task easier. Then work your way from top to bottom. Start with mirrors, move to sink, then counter, then tub, then toilet. Also unexpectedly you will be cleaning from least dirty to most dirty. Thursday: Sort and start laundry. Friday: Finish the laundry *this may take longer than 10 minutes, but you should enlist helping hands around the house to fold, hand up, and sort. Even toddlers like to sort and match socks! Saturday: General straightening up – pick up trash, organize and put things back where they belong. The key is to keep things from piling up and it’s far easier to do a little cleaning rather than a lot of cleaning. One thing to strive to do for a few reasons is keep your sink clean of dirty dishes. Dirty dishes not only attract bugs, but a pile of dirty dishes in your sink will deter you from wanting to cook at home each night. This causes excessive money being spent eating out because you don’t want to add to the mess in the sink. A frugal home cleaning tip, that can help you eat better and will keep your kitchen more sanitary. Do not let the dishes pile up! Cleaning supplies can be expensive. You can literally buy a wipe for everything you need to clean and that can get pricey! You can buy leather wipes for your couches. You can buy pre-moistened Windex wipes for mirrors and windows. You can buy pre-moistened stainless steel cleaner wipes, and the list goes on and on. Not only are those things expensive, but since you probably won’t use them frequently, they can dry out in their containers creating more waste. Consider making your own cleaning wipes or supplies. You can buy a gallon jug of white vinegar for $1.99 and use a teaspoon of dish soap, rubbing alcohol and water. Additionally you can add an essential oil for a fresh scent to the cleaning solution. This DIY home cleaning is on the cheap for the supplies needed. You will need to use a paper towel roll and a canister. Remove the cardboard roll from the inside of the paper towel roll. Pour your cleaning mixture over it and keep the canister sealed, to keep the wipes from drying out. If you do not have a canister you can also use a gallon zip lock bag. These wipes work just great! DIY on how to clean your house for cheap by making your own cleaning wipes! If they dry out you can always add a little water too. You can make your own all-purpose cleaner that can cut through the grease and grime. Using half water, half white vinegar. You can again add a couple drops of an essential oil for scent. Put the mixture in a spray bottle and use it to cut through some dirt in your kitchen. Cleaning your kitchen doesn’t have to cost an arm and a leg. These DIY home cleaning product ideas will show you how to clean your house for cheap. Like I mentioned before, my best tip to keep the kitchen clean is to never let the dishes pile up. I hope that with these kitchen cleaning tips and tricks you and your family can benefit more from your kitchen environment. One of the important place to clean around the house is the bathroom. There are many bathroom cleaning tips, but I like to keep it simple. You can use the same cleaner from your kitchen in your bathroom. It’s not a bad idea to add a second container or zip lock bag of cleaning wipes and just keep them in the bathroom and whenever you are in there, you can grab a wipe and clean the counter to keep the grime from piling up. Don’t forget to clean the mirror and toothbrush holder, and of course, the best bathroom cleaning tip is to clean / replace the toilet brush every once in a while, to prevent unwanted smells. 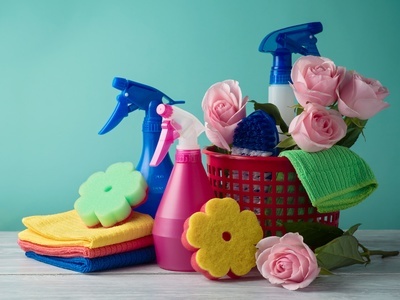 Your Last Tip Top House Cleaning Tip: you have to start with a deep clean of your home to be able to get to the 10 minutes of cleaning a day. You cannot start with a dirty house that has needed cleaned for weeks and expect to get a clean house with only 10 minutes a day. There is no need to renovate your home, but you must start with a thorough cleaning. Also the 10 minutes is dependent on the size of your home. Now, let’s get started because this house isn’t going to clean itself!